Over 30 per cent maternal deaths in the country happen due to the unavailability of blood in emergency cases. A high percentage of road accident deaths also happen for the same reason. Health activists believe that legalising unbanked direct blood transfusion (UDBT) can arrest the growing number of deaths because of the unavailability of blood units. Under UDBT, doctors test potential donors for blood type and screen the blood for infections before transfusing it directly to the patient without banking or storage. Health activists say UDBT is inevitable in the country where most small towns and villages do not have blood banks. The World Health Organization (WHO) in 2008 estimated that around two million units of blood are transfused annually in India through UDBT and another four million units are sold through blood banks. This still leaves a shortage of almost four million units in the country every year. The Jan Swasthya Abhiyan (JSA), the Christian Coalition for Health in India and the Association of Rural Surgeons of India (ARSI) had on September 25 written a letter to the Government of India, demanding the regularisation of UDBT. The letter was written to highlight the shortage of blood units in the country and to protest the government action against doctors who undertake UDBT. The mandatory guideline that only people known to the patient can give blood to banks should be relaxed, especially in a life-threatening emergency. In one recent case of such government action, two lab technicians at Jivan Jyoti Christian Hospital were jailed for 10 days in July this year. A case was registered against them along with two other lab technicians and a doctor in 2011. In another case last month, district officials raided the Guanandurai Hospital in Sivakashi, Tamil Nadu and seized 90 bags of blood. While the hospital medical superintendent confirmed the news, the police have not filed an FIR in the case. In their letter, Anant Phadke and Amit Sengupta of JSA have demanded that the old method of UDBT should be revived till the blood deficit does not end in the country. “There is a dire need to legalise UDBT with well laid out procedures, including mandatory tests and record keeping,” the letter reads. JSA claims that UDBT is as safe as banked blood transfusion if the mandatory tests are done, which is why it is allowed in the United States. “I had sent the letter to the health secretary and other officials of the health department in August. They seem to agree that UDBT could be a big relief for the common people,” says R R Tongaonkar, former president of the ARSI. The National AIDS Control Organisation (NACO) objects to using rapid test of blood samples in UDBT. Instead they suggest that ELISA test is used, which is not feasible when only a single blood sample needs to be tested. However, Tongaonkar says WHO has recommended rapid testing and has said that it is reliable if the sample is small. “We are not against regulation. The entire business must be regulated but people should not be deprived of their basic right to live,” Tongaonkar says. The people opposing UDBT believe that legalising the method will lead to unregulated blood transfusion, a claim that JSA refutes. “This is insensitive talk. Unscrupulous elements exist even in the absence of UDBT,” Padhke says, emphasising on the need for the government to regulate the system. He suggests that every hospital willing to practise UDBT must get a registration and the government should keep a close tab on them. He says the government’s failure to monitor the system cannot be an excuse to allow people to die. Speaking at a function organised on Blood Donation Day (October 1), Aradhana Johri, additional secretary of NACO, claimed that AIDS caused through blood transfusion has come down to just one per cent from 15 per cent in 1999, when the AIDS awareness campaign was started. She admitted that blood deficit is growing in the country, but said blood collection has more than doubled since 2007. Experts are also demanding a solution similar to that of the Armed Forces Medical Services. In 2001, the government amended the rules of the Drugs and Cosmetics Act and allowed Arms Forces Medical Services to do UDBT in an emergency. The president of the Delhi Network of Positive People, Vikas Ahuja, says people must get blood in need. Ahuja, who contracted HIV through a blood transfusion in 1993, says that it is the government’s responsibility to find out a way which will not only stop HIV infection through blood transfusion but also ensure that everyone gets blood. Union health secretary Keshav Desiraju says the government is looking at options. He says while people demanding the removal of the ban on UDBT claim they are practising it “illegally but ethically”, the government will look at what can be done within the law. He says the government needs more clarity on the issue before amending the Drugs and Cosmetics Act. UDBT in practice despite ban Several hospitals continue to use UDBT despite a ban on it. The government amended the Drugs and Cosmetics Act 1940 on April 5, 1999, and banned UDBT to stop the spread of HIV infection though transfusion. The National Health System Resource Centre (NHSRC), which is the government’s apex body for technical assistance in healthcare sector, recognises the huge deficit of blood in the country and supports UDBT. After receiving letters from experts, the health secretary asked NHSRC for its comments. In response, NHSRC prepared a report. 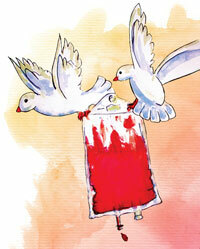 Its documents show that only 31 per cent of the total blood demand is fulfilled by blood banks. In Chhattisgarh, only 19 per cent demand is met through blood banks. Giving an example in support of UDBT, NHSRC said that the Jan Swasthya Sahyog hospital in Chhattisgarh, which needs 700 units of blood every year, manages to get only 165 units from blood banks. The remaining demand is met through UDBT. Over 500 patients might die in the hospital every year if UDBT is not practised, suggests the report. In the report, NHSRC has said that blood shortage has widened because drug inspectors in some states have been rigorously implementing the rule that blood bags should be sold only to licensed blood banks, thus, making UDBT almost impossible in those states. The report said it will be difficult to achieve the national targets for reducing the maternal mortality rate with the ban on blood bags. It said that the spirit of the law is to prevent HIV transmission and not deprive people of their lives. It clearly mentions that while the drug controller’s office is concerned with regulation, NACO has blood safety as its priority to avoid infections from blood. But no one is actually accountable for blood availability to the people who need it. The opposition to UDBT may be because of the private players who are in business of banking blood. A doctor, requesting anonymity, said that they might be pressurising the government not to lift the ban on UDBT as it will hurt their business. Among the total 2,545 blood banks in the country at present, 1,564 are private blood banks. Blood banks and organasiations are keeping donors' list as secret. because of this needy persons are facing several problems. This leads to black marketing of blood. They should open doners list with phone numbers. So that we can avoid middlemen. Needy persons can diirectly contact the doner. friends to support.org is doing this type of work from Andhrapradesh. I think the unswer lies in opening small blood storage units in all village hospitals than promoting unsafe blood. UDBT done ethically, correctly can save lives. A friend of mine - himself a doctor, blood bank owner and running a AIDS Awareness program could have had a disaster in his own family, if UDBT was not available, a decade or more ago. He believed in voluntary blood donor list and could get 20 or more donors on the hospitals within 15 mins. His wife who had severe PPH survived, thanks to this. Any concern about UDBT's misuse can be overcome if clinical and social audit as mandatory under the sleeping Clinical Establishment Regulation Act.